The first barrier is a High pressure system sitting, at start time, about half-way between the Bearing Strait and the first mark. It’s a starboard beam reach to get to the High, and a port beam reach leaving the system — or it would be if the system stayed put. 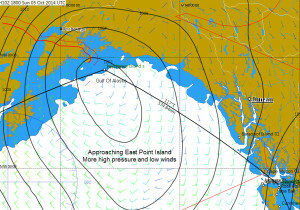 The forecast is for the High to move NW and out of the way by the time the fleet gets there. 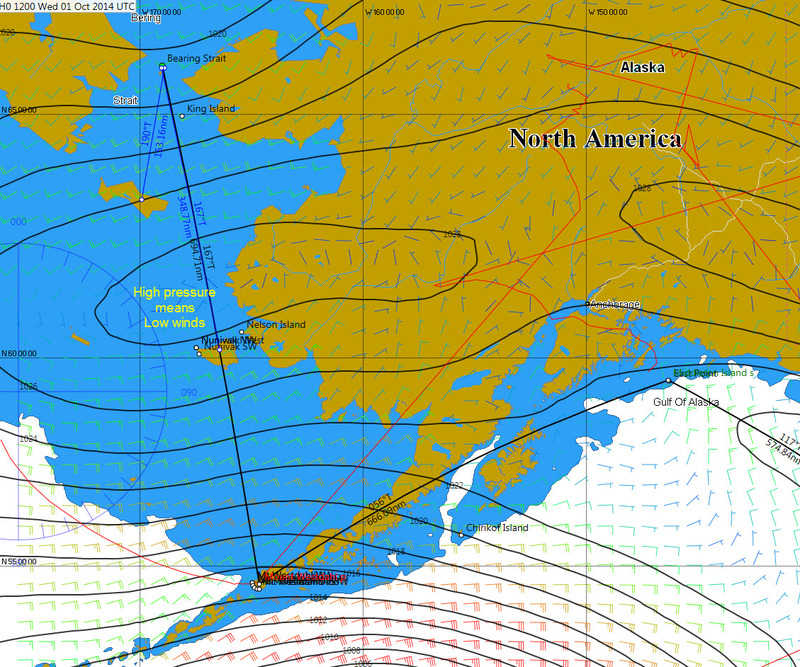 The favored route leaves St Lawrence Island [about 150 nm S of the start] to starboard. The jury is still out on how to leave Nunivak Island [about 350 nm S of the start.] That depends on the movement of the High the speed of the fleet. Last year the play was to leave Nunivak close-aboard to port — but that was last year. Mt Westdahl, the first mark, sits well inland. Skippers using routing software may want to define a “wet” path around the west end of Unimak Island. 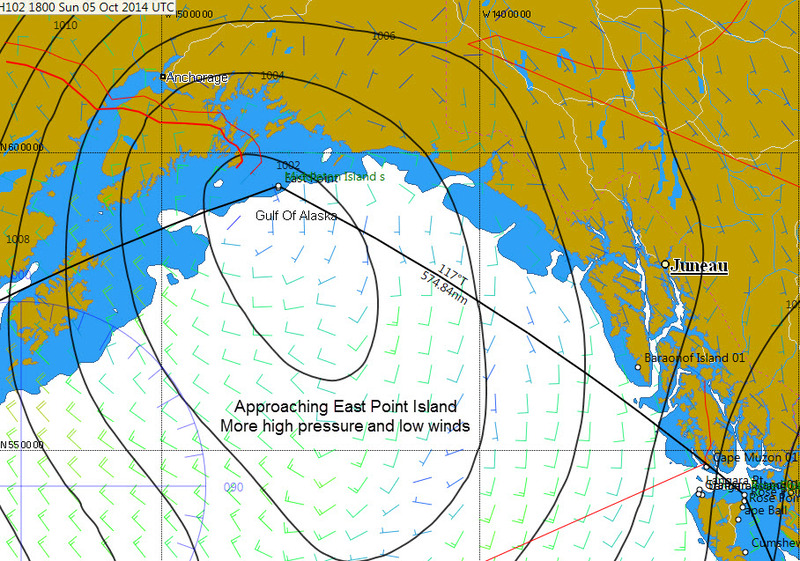 The good news is that passing through the Aleutians gets the fleet to storm winds. 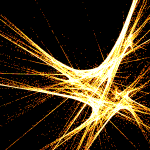 Winds shift from a broad reach to a beam reach and TWS increases. At least that is the forecast right now. The first mark is a couple of days away. Approaching Middleton Island, and dancing with another High Pressure system. Last year the second mark was guarded by a large area of ‘blue goo’. That could happen again, despite the storms in the area. This looks like a timing issue — the weather depends on when you get there. But this is some three days from the start. Plenty of time for updates between now and then. Further down the coast, the issue will be whether the mid-pacific High allows the storms to reach landfall south of the US/Canadian border. A “Yes” answer means strong wind, but on the nose. A “No” means the winds should come from abaft the beam, but with less intensity than winds associated with a storm Low . 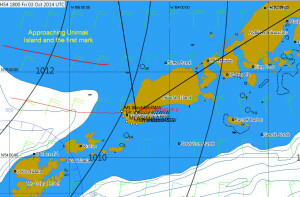 Initial routing shows an estimated time of 14-15 days for the race. Javakeda is passing on the race this year to focus on IRL routing in the Atlantic. But that just makes it easier to provide some commentary as the race progresses.